Coconut water is the delicious and nutritious liquid found in young coconuts. Coconut water is good for you because it contains minerals, fiber, and other healthy nutrients. Drinking coconut water is good for replacing lost fluids and electrolytes, lowering your blood pressure, and helping you lose weight quicker. The best and healthiest type of coconut water is the liquid from immature coconuts. This clear liquid in the green coconut contains the greatest number of nutrients. 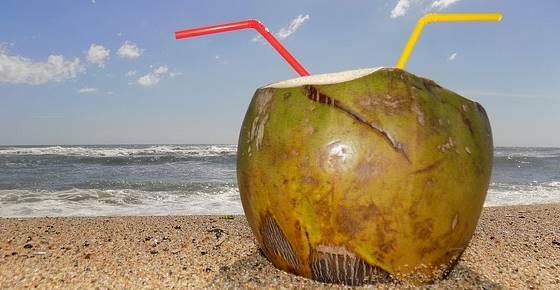 People in tropical regions where coconuts grow have enjoyed consuming coconut water for centuries to boost their health. Many recent scientific studies also point to the amazing health benefits of drinking coconut water. In this article, you will learn about the many reasons why drinking a glass of coconut water every day is good for your health. You will also learn if there are any side effects of consuming too much coconut water. Plain coconut water is a popular drink in many cultures in tropical countries. Coconut water that is consumed for its health benefits is generally from green coconuts. Many people say that coconut water tastes sweet, slightly nutty with a light acidic aftertaste that refreshes the palate. Young coconut water has a similar consistency to water and contains rich mineral content. There is a great difference between coconut milk and coconut water. Coconut milk is made by crushing or shredding coconut meat and adding water to it. Coconut milk contains much higher levels of fat than coconut water. For example, one cup of coconut water only contains 0.5 g of fat whereas one cup of coconut milk contains 57 g of fat. Coconut water also tastes different from coconut milk. Coconut milk tastes rich and creamy with a distinct coconut flavor. Drinking coconut water is a healthy way to replenish lost fluids and also boost your health at the same time. A serving of coconut water from one coconut (about 206 grams) contains 5.4 grams of sugar. Coconut water is also rich in minerals that help to keep your heart and bones healthy. A cup of coconut water contains 60 mg of magnesium (15% of your recommended daily intake), 600 mg of potassium (17% RDI), and 0.3 mg manganese (17% RDI). Coconut water also contains calcium, iron, phosphorus, copper, and zinc. The electrolytes in coconut water, like magnesium, potassium, and sodium, can help to rehydrate you after physical exercise or losing fluids due to having diarrhea. The main mineral in coconut water is potassium, and regularly consuming coconut water can help prevent a potassium deficiency. Is coconut water good for you? Medical studies have shown that drinking coconut water everyday is good for your health. Coconut water is a low calorie electrolyte drink which is full of healthy nutrients that are good for your heart, brain, weight management, liver, and your kidneys. Let’s look in more detail at the many proven health benefits of coconut water. One of the benefits of drinking fresh coconut water rather than water is that coconut water helps strengthen your immunity. You can learn about other important ways to strengthen your immune system naturally. Drinking coconut water is healthy after exercising because it helps to replenish minerals lost during physical exertion. Find out about other delicious rehydration drinks you can make at home to replenish lost minerals and electrolytes in your body. Consuming natural coconut water daily can help to improve your cardio health and help your heart recover after a heart attack. Learn more about lifestyle changes you can make to lower your risk of a heart attack. Pure coconut water is good for helping to treat hypertension because of minerals like potassium. High blood pressure puts extra strain on your heart and other organs and can lead to heart disease and stroke. There are also many other steps you can take to lower your blood pressure and reduce your risk of stroke. Coconut water is good for you if you have high cholesterol because compounds in coconut water help to lower cholesterol levels. Both tender coconut water and mature coconut water showed cholesterol-lowering activity. Find out what else you can do to get your cholesterol levels down and prevent having to resort to anti-cholesterol medication. Mature coconut water is good to drink if you have diabetes because it is low in calories and helps to reduce blood glucose levels. Did you know that apple cider vinegar is also a refreshing drink that helps to lower blood glucose? One of the benefits of drinking coconut water daily in the morning is that it may boost your efforts in losing excess body weight. Of course, increasing your water intake can help prevent overeating. However, various studies have shown that coconut water has an anti-obesity effect and can help prevent complications associated with being overweight. Coconut water is low in calories and has a refreshing sweet taste and can help you consume fewer calories when you are on a diet. Regularly consuming sweet, nutty-tasting coconut water benefits your memory and can prevent the onset of dementia. Learn about some common habits to avoid if you want to keep your brain functioning well. It is safe to drink coconut water on an empty stomach because minerals in coconut water help protect your stomach lining. Learn how to get rid of Helicobacter pylori infections naturally which are often the cause of stomach ulcers. Regularly consuming a glass of deliciously tasting young coconut water every day has anti-aging effect and may help to reduce some of the effects of getting older. Learn about other foods that help to delay the appearance of fine lines and wrinkles. One of the benefits of drinking coconut water from green coconuts is that the refreshing coconut liquid promotes a healthy liver. Learn about common habits that damage your liver. Natural coconut water acts as a natural diuretic and can help protect healthy kidneys from various renal disorders. However, as already noted, people with chronic kidney disease should limit their intake of potassium-rich foods which would include coconut water. Find out other ways to treat kidney stones naturally and how to use apple cider vinegar for kidney stones. Consuming the tasty water found in immature green coconuts is generally safe for most people without causing any adverse effects. However, adverse effects caused by too much potassium in coconut water is usually only experienced by people who have kidney dysfunction. Drinking Coconut Water Every Day: What is a Safe Dose? There is no official recommended dose for drinking coconut water for its health benefits. However, as always, moderation applies and you don’t want to over-do it. Usually 1 cup a day is enough. Coconut water can be found in supermarkets, health food stores and online. The best type of coconut water to drink is straight from a fresh, green coconut. All you have to do is slice the top off and enjoy the sweet, subtle taste of pure coconut water. However, not everyone is fortunate enough to be able to purchase green coconuts. The best type of commercially available coconut water is cold pressed pure coconut water without added ingredients. This contains high levels of minerals and vitamins. If you want to benefit from high-quality coconut water, then you should avoid the type that has been highly processed. Pasteurization kills off many of the beneficial enzymes and nutrients in raw, pure coconut water. Flavored coconut water has also become popular. However, companies often flavor coconut water to disguise the acidic taste of mature coconut water. So always read the product label to see if any ingredients have been added. I try to get mine at Costco, unless some place else has a great sale, they have the best price. One day I was starving and we were far from the restaurant. I stopped in a market where I drank coconut water and ate the meat inside, I was no more hungry, could wait one more hour for lunch. It’s a wonderful fruit and so delicious. Thanks for the information. Question: I am allergic to peanut and was told that coconut is part of the nut family and should avoid coconut. Is this true? You can drink both. From what I’ve read young coconuts have more ‘water’ in them, and for some it tastes better. Is it ok to drink the one they sell in stores from the can or does it have to be natural? Hi Jose, read the label of the ingredients and see what it contains. If it’s loaded with additives, flavors and preservative, don’t buy it. Opt for 100% organic and raw that is not processed with any heat. I love to mix my drinks with half coconut water, and half regular water, as I’m not a fan of the taste unless it’s fresh from young coconut, but i know it has so many great benefits. I like coco-hydro (dehydrated coconut water, all the goodness, just needs to be rehydrated in water) too, since it’s much easier to take with you somewhere or store if you have a limited amount of storage space. We have a lot of coconut trees in the Philippines…Every day you can drink it as long as you want.It is really good in our body. Good for your kidney used as cleansing.. Thank you,we have it in Africa in abondance,no sugar adding,you are invited to the tropicals. Coconut water is a very effective remedy for headaches. No matter how bad you just calm down. I can say coconut water is better than cranberry when it comes to treating Urinary tract infection. I have used this and it really works quicker. Hi jenny its George i really like your articles because they really help me understand my life. I have a question that has troubled me for long,my wife sometimes find it difficult to breath just for some time then she feels to be good,how can i overcome this kind of problem naturally? Because am afraid one day it can happen to her when am not in the house and she just pass on and i don’t want to lose her because she is the love of my life.Thanks in advance. Hi George, since I’m not a doctor, I cannot diagnose specific cases and give advice as it would be irresponsible from my side. I don’t know what causing the breathing difficulties of your wife and how long it has been like that. Your wife really needs to see a doctor who knows her medical history and is able to do the required tests to provide an accurate diagnosis and a treatment plan. I apologize I cannot be of any help, but I wish your wife to get well soon!